With a chaotic weekend that included a Taylor Swift concert at Heinz Field, PrideFest and the Three Rivers Arts Festival, there’s plenty that could’ve gone wrong. Thankfully, the Arts Festival’s featured public installation — New York City artist Rudy Shepherd’s “Black Rock Negative Energy Absorber” — was designed to keep it all together. On display in the center of Point State Park, the 10-foot-tall rock aims to rid festival patrons and the city as a whole of bad vibes. For Emily Balawejder, a lifelong Pittsburgher who’s attended the Arts Festival for as long as she can remember, the piece fits right in. Along with a worry-free confluence of locals and visitors, the Three Rivers Arts Festival successfully kicked off its 54th celebration last Friday. Sponsored by Dollar Bank and the Pittsburgh Cultural Trust, the event featured local and national artists, bands and food vendors. The festival’s grounds covered Point State Park, Gateway Center and the Cultural District, and the free festivities will continue through June 14. Sporting an all-white pantsuit and oversized sunglasses, seasoned pop-rocker Jenny Lewis kicked off the celebration with her headlining set on Friday at the Dollar Bank Main Stage. In front of a packed crowd at the Point, Lewis played fan-favorites like “She’s Not Me” and “Just One of the Guys,” leaving the audience screaming for an encore at the end of her set. Aside from Lewis, bluegrass collective Railroad Earth performed Saturday night and indie pop group Alvvays closed out Sunday with their lo-fi tunes. 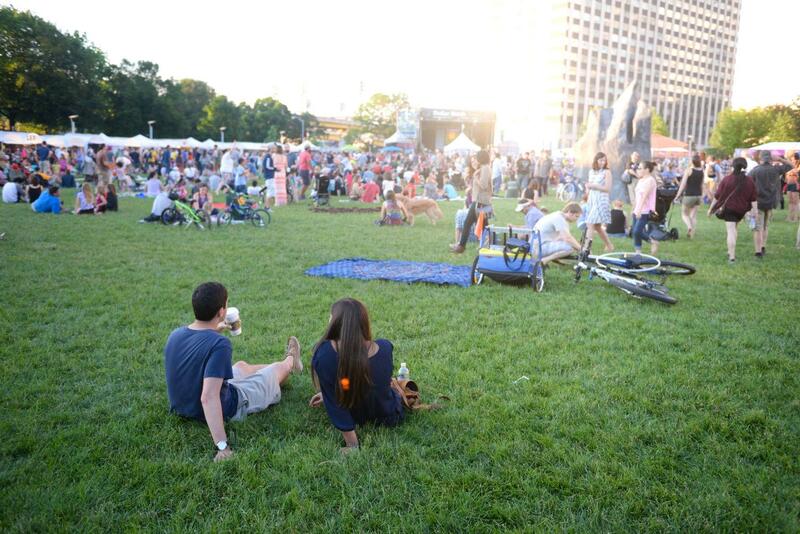 According to Elizabeth Baisley, the marketing director for 91.3 WYEP and 90.5 WESA, the Arts Festival’s music offerings provide an opportunity for Pittsburghers to come together and appreciate a free event that they can’t find anywhere else. “I think forging a sense of community and connection around music is a great thing to do,” Baisley said. Aside from the performing art, the Pittsburgh Cultural Trust’s green efforts impressed festivalgoers as well. Free water stations were scattered throughout the area — which cut down on the need for plastic bottles — and kids and their families enjoyed environmentally-friendly activities, like the Pittsburgh Center for Creative Reuse’s Reuse-a-Palooza. Reuse-a-Palooza, which has been a staple of the Arts Festival for the last five years, encourages kids to make their own crafts and inventions out of reclaimed materials. At this year’s event, children made robots out of cassette tapes, wind chimes with discarded metals and superhero capes using recycled fabric. Katy DeMent, Reuse-a-Palooza’s lead teaching artist, was thrilled to see the creativity from the kids, made even better by the activity’s message of environmental responsibility. The children weren’t the only attendees with impressive art. Painters, sculptors and designers lined the maze-like Artist Market, which weaved through the entire festival. Each artist had a tent where they sold their work, exhibiting a wide range of products that included fine jewelry, purses crafted from recycled materials and photographs of abandoned Pittsburgh areas. The vendors included Pittsburgh Pottery, which sold yinzer-inspired ceramics and clothing, like a shirt with “Jagoff” written on it, while local artist Chaz Letzkus displayed his “Look Closer” pen and ink drawings, which show hidden images drawn inside larger pictures. “Shark Absorber” highlighted the collection, featuring a sketch of a shark with Justin Bieber in its mouth, filled in with countless tiny sharks. Some artists, such as Lex Covato of Lex Art Studios, have even developed relationships with their customers. Covato, a Pittsburgh-born illustrator who has featured her art in the festival for the past five years, depicts historical, fictional and pop-culture figures tattooed with their respective iconographies, has patrons who return every year to see her latest creations. In “Abraham Lincoln’s Tattooed Proclamation,” the president is pictured shirtless (save for suspenders), marked with stars and stripes, a portrait of his wife and the year of his assassination. Covato said that the event makes art more accessible, slowly bringing Pittsburgh’s arts scene closer to that of the nation’s top metro areas.